DIMENSION - The length of the sleeve is 13.4in (34cm) and stretches to 39.4in (100cm). The wrist circumference is 3.2in (8cm), stretches to 5.1in (13cm), the upper arm circumference is 3.9in (10cm), stretches to 8.3in (21cm). Suitable for most adults. And all these sleeves are allowed for machine wash and hang dry. 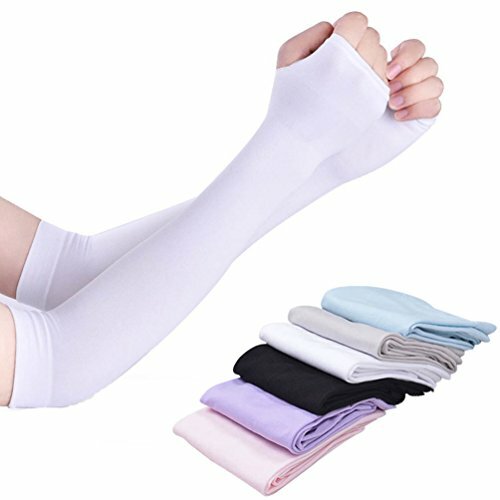 HIGH ELASTICITY MATERIAL - Made of cooling polyamide and spandex high elasticity material, which can give you cool feeling in hot weather, and the new anti-bacterial material is soft, elastic, more skin friendly, and has good flexibility and good moisture absorption ability. SUN PROTECTION - Our arm sleeves can block out almost harmful UVA and UVB rays, protecting your skin when driving, golfing, fishing, cycling, hiking, doing sports. Perfect for Indoor Outdoor Activities. SEAMLESS TECHNOLOGY - Use Seamless technical, no itchy and leave imprints on your arms. V-type knitting process fits to the arm curve, helping the arm to release the pressure better, which is suitable for human engineering. PRACTICAL & DURABLE - The hand cover ensures full coverage while the thumb holes will keep your arm sleeves in place, protect your arm and hand skin. Long usage and lightweight material, convenient to carry with you. If you have any questions about this product by Swesy, contact us by completing and submitting the form below. If you are looking for a specif part number, please include it with your message.